The rear bumper is a modified 1969 Galaxie unit with back-up lights added. Norman Veber of Replicas & Miniatures Co. of Maryland duplicated the plastic masters in resin. The resin copy was chrome-plated by Little Motor Kar Co. of Pennsylvania. 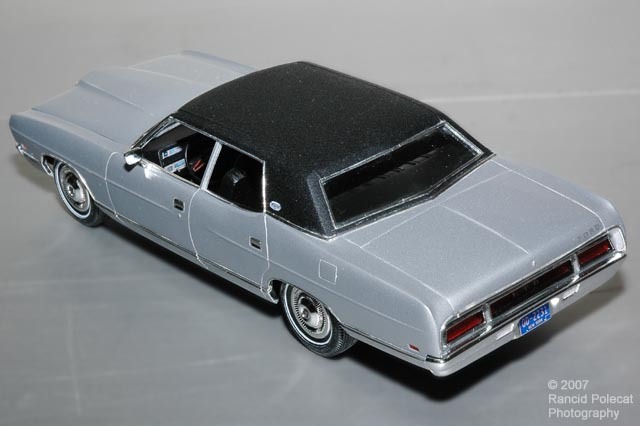 Other major body changes shown above include a reshaped rear window, roof pillars, tail-light panel (which started as a 1964 Mercury custom piece), side character ridges, side reflector lights, door handles, and wheel openings. A new trunk lid with a dorsal ridge came from a Revell '64 Pontiac GTO. Howard updated the 1970 interior bucket, sanding it smooth, then adding new door panel and upholstery patterns with Evergreen strip plastic. The front seat started as a 1970 Chevrolet Impala part. Howard had to reshape the 1970 Ford dash, but was thankful that he could used the steering wheel without changes. He painted the interior with Tamiya flat and semi-gloss black. As with the body emblems, Howard created the dash instruments and interior wood grain panels by editing images from car-show photographs, eBay auctions, and dealer brochures.